Hi all, I’m excited to share the cover of my new novel, which will be released early May 2019! Quirky … I guess that seems to be my taste in shows and movies as of late, since I obviously don’t get enough of that in my life. Okay, people who know me will readily realize that I was being facetious here, but I added the “italics” for those of you who don’t yet know my snark-ish nature. So … where was I? Oh, yes, “Quirky” and my tastes in entertainment. Like my last review of Letterkenny, my current enjoyment of The Good Place, and my re-watching of Brooklyn Nine-Nine before the new season starts, I’ve lately become engrossed with characters and situations that are a tad peculiar. “What? Oh, do tell us,” you say? Handsome: A Netflix Mystery Movie stars Jeff Garlin, as the primary protagonist, Gene Handsome. You may know Garlin from Curb Your Enthusiasm, and, lately he plays the hilariously “overly-weathered” father on The Goldbergs. In Handsome, which he also wrote and directed, he’s a Los Angeles Homicide Detective, who is “overly-weathered” and, well, a bit lonely. He has the sweetest dog in the world, though … but more on that later. He’s surrounded by a great cast of supporting characters: Amy Sedaris, who plays his lecherous (yes, I know you normally don’t call a woman “lecherous” but it’s the best way here) boss, Lt. Tucker. Natasha Lyonne, his overly-sexed partner, Det. Fleur Scozzari. Steven Weber, an egotistical actor, Talbert Bacorn, who finds a dismembered body on his front lawn. And, of course, to make this menagerie complete, he’s also surrounded by a team of idiot coworkers, an annoying neighbor and his accordion-playing wife (well-played by Leah Remini), a new single neighbor (and possible love-interest) with her weirdo daughter, a neighbor who likes to hula hoop outside, and the cutest and sweetest GreatDane (who, I believe, steals the show as Candy). The story is what it is in the title: a mystery. Handsome and crew investigate a murder of a young woman, who is found on Bacorn’s front lawn, decapitated and dismembered. I will forewarn you in “a death foretold way” that if you pay attention, “who did it” isn’t the mystery here. Instead, it is the investigation that uncovers the life and, ultimately, the death of someone, who, for better or worse (and her own doing, mind you), found herself in a complicated web of other broken people. The fun, of course, is watching Handsome navigate through all of these complexities … and quirks. It is currently playing on Netflix. Give it a view. True enough, I suppose. But anyone who’s read my novels and actually follow the mad ravings I post on social media know that … well … I’m quite opinionated … even though I try not to be too “judgy” if you know what I mean. “Whoa! Peddle the Breaks now!” you might say, since this is probably the most I’ve ever really written on a blog post, let alone the rampant fart jokes on FB. BUT buckle-up, buttercup! Because this is my first ever review on my blog! This is the brief but glorious intro to just about every episode of a series based in a fictional, rural town in Ontario. If you don’t know where Ontario is–God help you–just know that the series is based in Canada, so, just as some of my word choices above have indicated, there are some colloquialisms that you might need to hear a few times before they start to sink in. The series was created by Jared Keeso and Jordan Beirnes, the former contributed to much of the writing and directing of each episode. It is on CraveTV, which is, unfortunately, inaccessible for subscription to us folks in the USA. Therefore, I watched two of four wonderful seasons on Hulu. Don’t let Canada’s obvious attempt of “cold-heartedly” sequestering such joy from her, as of late, seemingly mildly-retarded cousin (Sorry, I mean mentally impaired). This show is a gem, as it follows the lives of the “hicks, skids, hockey players and Christians,” each group trying to make their impact in a town that … well … is at least big enough to have a produce stand, a hockey team and a bar (hmm … which I believe might have closed). The primary protagonist is Wayne, who is a “hick,” is the “toughest person in town,” which is important thing to know, and is played by Jared himself. Other primary characters are his sister Katy, his friend Daryl, who they “affectionately” call Dary, and Dan, who we later discover is “too fat to run.” Then, of course, there are the secondary characters, who are pulled from the before mentioned groups. Unlike my normal brain fodder that I read, watch and, well, write, there are no gratuitous explosions, gun battles or otherworldly sets (okay, rural Ontario could be considered that). Each episode, instead, treats you to beautiful wordplay as characters often throw barbs at each other … or just sit around and ponder the nature of people and things, such as ongoing discussions about schneef, fundip and horns. If you, like me prior to watching this show, had no idea what I just said, Letterkenny will broaden not only your Canadian vocabulary but also your mind. Wha???? Eggs cooking on a sidewalk??? Well … no … maybe … they say it’s going to be 99 in in Portland tomorrow. Hello! Thank you all for the reads and the great reviews! So far, I’m editing my next novel for release (5/2/19) and also working on additional projects. Hey, Goodreaders! 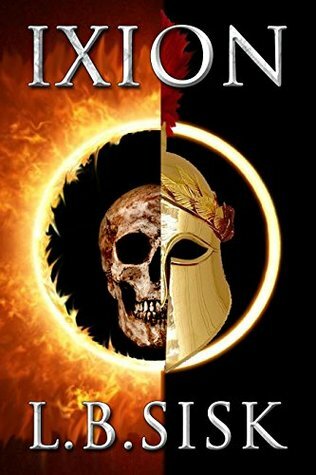 Enter to receive a free copy of Ixion! Giveaway ends June 30, 2018. I’m launching at $0.99, but it will go up to $2.99 on Friday.